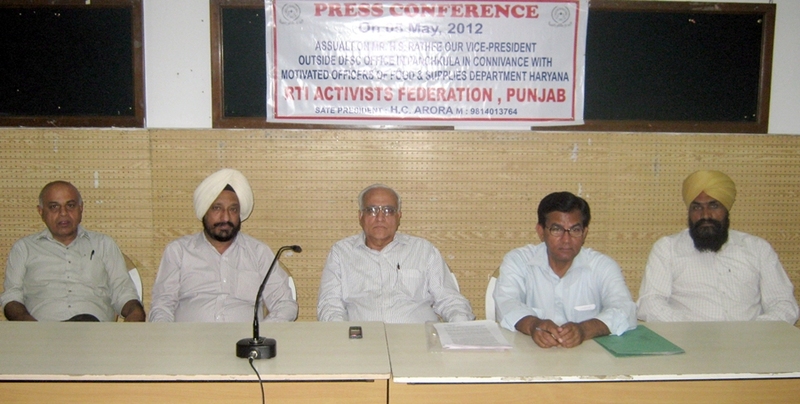 RTI Activists Federation, Punjab condemns attack on its Vice President, Mr. H.S. Rathee, outside District Food Supply Officer’s office in Panchkula – demands prosecution of goonda elements involved in the attack. Federation expresses its shock that Panchkula Police is not seriously investigating this serious matter. Addressing a Press Conference at Press Club, Chandigarh, Advocate H.C. Arora, State President of RTI Activists Federation, Punjab stated that certain goonda elements hired by certain depot holders outside the District Food Supply Controller, Sector-6, Panchkula, assaulted Mr. H.S. Rathee, Vice President of RTI Activists Federation, Punjab who had visited the office of DFSC in Sector-6, Panchkula at 2:00 PM on 30.4.2012 for inspection of certain records in connection with an RTI application filed by him. After Mr. Rathee reached the office of DFSC, all the officers, including DFSC, AFSC etc. slipped away from office. Only a lady Dealing Assistant remained in the office for facilitating inspection. After some time, after completing inspection of whatever documents/registers were made available to him, Mr. Rathee came out of office, when suddenly about 15-20 goonda elements assaulted him. Mr. Rathee fell down on the ground and was mercilessly beaten by those persons. Mr. Rathee thereafter arrived at police post in Sector-6, Panchkula, where his complaint (DDR) is being registered. Arora stated that he suspects the various depot holders of Panchkula behind the aforesaid cowardly attach/assault on Rathee. Those elements are supported by the DFSC, AFSC etc. of the Food and Supplies Department for obvious reasons. Arora further stated that PDS (PUBLIC DISTRIBUTION SYSTEM) in Panchkula, like the one in UT Chandigarh, is tainted with corruption, and whenever any information under RTI Act is sought, the concerned Depot Holders file a complaint with Police that there registers have been stolen. The Food and Supplies department officials do not take any action against concerned Depot Holders. The corrupt elements within such Depot Holders then start complaining to the Police that they are being black-mailed by the concerned RTI Activists. This is precisely happening in Mr. Rathee’s case also. Arora, speaking on behalf of RTI Activists Federation Punjab, has appealed to the police authorities to investigate into the matter impartially, and to book the concerned offenders immediately. This can be done only if they interrogate the concerned officials of Food and Supplies Department, who mysteriously left their office mysteriously just after Mr. Rathee, reached their office, which was followed by attack on Mr. Rathee. Rathee, who was present at Press Conference, explained the whole incident. Mr. S. M. Bhanot, a noted RTI Activist of Chandigarh, Mr. Manphul Singh, Executive Member, and Mr. Kuldip Walia, District President, Mohali, RTI Activists Federation also attended the Press Conference.